Provo, UT: BiWorld, 1979. Text/BRAND NEW & Bright. Illustrated soft cover/NF w/trace creasing to lower front corner. PO stamp to upper corner of title page. First published 1976; this is the 9th Printing of 1979. 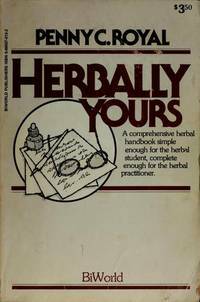 Alphabetized guide to use of herbal remedies.. First Edition, 9th Printing of 1979. Soft Cover. Near Fine/None as Issued. New York, NY: New American Library/Signet Books, 1966. Stated First Printing. Text/BRAND NEW. Soft cover/NF with light wear. Text edges dyed red. The Medicare Act was signed into being in 1965 by President Lyndon B. Johnson with benefits for people over sixty-five in mind. This book explains what Medicare is, both in its Basic Hospital Plan and Voluntary Medical Plan.. First Edition, First Printing. Soft Cover. Near Fine/None as Issued. London, UK: W.B. Saunders, 1979. BRAND NEW Copy. Gilt embossed maroon boards/Fine. Tri-annual publication. 19 contributing authors. The ten articles are: 1, The Immunopathology of Hodgkin's Disease; 2, The Role of Computed Tomography of the Abdomen in the Diagnosis & Staging of Patients with Lymphoma; 3, Staging in Hodgkin's Disease; 4, Issues of Controversy in Radiation Therapy & Combined Modality Approaches to Hodgkin's Disease; 5, Chemotherapy of Hodgkin's Disease; 6, Staging in Non-Hodgkin's Lymphoma; 7, Radiation Therapy for Non-Hodgkin's Lymphoma; 8, Chemotherapy of Advanced Non-Hodgkin's Lymphoma; 9, Mycosis Fungoides; and, 10, Non-Hodgkin's Lymphoma in Childhood. Fine copy.. First Edition, First Thus. Hard Cover. Collectible - New/None as Issued. First Edition, First Thus.